With the international break (which saw new coach Toshiya Miura mastermind a 6-0 over Myanmar) behind us, the V League returned to action with Long An in the capital to face T&T. Long An are battling with An Giang to avoid the relegation play-off against Can Tho, while T&T are trying to fend off Binh Duong and Thanh Hoa in their pursuit for back-to-back titles. It was another scorcher in the capital, with the 5pm temperature above 30C and the feels like temperature soaring to 39C! I, like most of this part of the world was suffering with world cup tiredness after witnessing Costa Rica park a few buses in front of the Dutch at 3am. 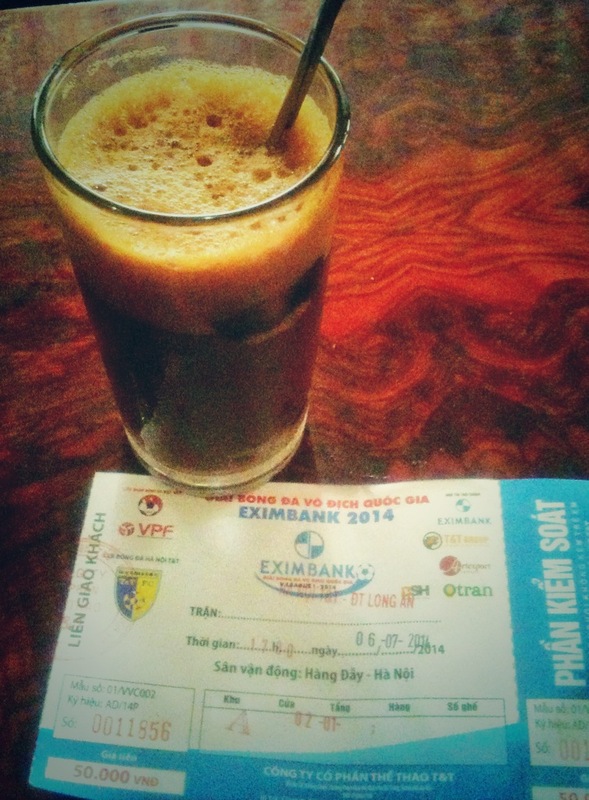 Fortunately coffee plays a big part in daily life in Vietnam, and it’s very strong, perfect for the nocturnal football fan. Even with Samson still suspended I was confident that Ha Noi would easily record their thirteenth victory of the season. Gonzalo, Thanh Luong and Van Quyet have all recently hit form, while I noticed a couple of the visiting players (substitutes) smoking cigarettes at a tea stall prior to kick-off. This should be easy. Hanoi T&T coasted to a 2-0 lead in the first half, thanks to a brace from Argentine striker Gonzalo and while the half time PA systems blasted out music, ensuring no one would have a power nap, all I could think of was how many T&T would win by, especially if National team striker Van Quyet was introduced from the bench. Long An coach, Ngo Quang Sang , clearly had other ideas and somehow managed to rouse this group of players, that at times in the first half already seemed relegated, and they put in an incredible second half display. Hong Son in the Hanoi goal was tested twice early on, before Tran Chi Cong eventually pulled a goal back. Nigerian striker Oseni was growing in to a real threat and began tested the credentials of central defence pairing Duy Khanh and Cyrus. And it was the Nigerian who completed the incredible comeback with two goals in six minutes minutes. Not for the first time this season, T&T’s defence had collapsed, with the title chasers now having conceded seven goals in their last two games. With just four minutes remaining the few of us still inside slumped down in our sweat. But there was to be one final twist in the dying minutes of the match. Just after forcing Long An kepper’,Quoc Cuong, in to a fine save, inform Van Quyet lost his marker and powered in a header. HaNoi T&T has somehow managed to lose the game and then dramatically steal a point. With just 5 games remaining this could prove to be a vital point gained or two lost. Next up is the big one. Song Lam Nghe An and their traveling support visit the capital.